Cecilia RE, of Fiammamonza, has been, for many years, one of the best young midfielder of the Italian Championship, so much to be called for a long time in the national team, first nell'Under 17 di Sbardella and lately nell'Under 19 di Corradini. Last June, in addition, at the Golden Girls was awarded as one of the players who most distinguished themselves in Group A of A2 series. Young, beautiful, strong. The future in his hands. Valentina Giacinti, class' 94. One of the most promising faces of the Italian football scene. Born and raised sportingly in female Atalanta, in that orobic land that has always given birth to great players, Valentina only 18 can fully be defined as a backbone of the Nerazzurri. In his seventh championship with the Goddess, he was the most prolific scorer between the Atalantine ranks and the third overall in group A of A2, with well 19 nets in 25 races played. For her you are opening the doors for the jump in a great team of the top league. But Valentina, is obviously not just a great player, but a beautiful girl who, although very young, shows a strong and secure character, worthy of a veteran. Read more: Young, beautiful, strong. The future in his hands. ELEGANCE, TECHNIQUE, GRINTA AND AN EVERYTHING TO CONQUER! The friendly Under 17 was played between our azzurrine and the German ones, that 25 Aprile of 2009 at the O.Martini stadium in Castelfranco di Sotto. After shaking hands with Ct Sbardella and Rita "Nazionale" Guarino I placed myself between the two benches for the usual photographic chronicle to be exhibited on the site of calciodonne.it. Beautiful game, the quality of the young protagonists and the good game expressed, put the excellent draw in the background. In the field there were two Valentina: the number ONE, which I will try to interview soon (what number that did that goalkeeper!) And the number TRE: A long blonde tail, elegant and decisive gestures, excellent technique, pushed lightly and forcefully its band, guaranteeing an excellent tactical balance during the defensive phase, covering every attempt of an opposing action. Read more: ELEGANCE, TECHNIQUE, GRINTA AND AN EVERYTHING TO CONQUER! DO WE WANT TO BET ON ALICE DE VAL? The leadership of the Graphistudio Pordenone in group B of the A2 series championship, led me to interview one of the protagonists of the Friulian company that aims, from last season, to the great leap in the category. The staff includes valuable athletes, well divided between experienced players, known by all, and young people with a certain future. Choosing one of these, for an interview, would have been a difficult task, however, facilitated by the words of a mister adversary, with whom I was comparing myself to the many Italian hopefuls, who surprised and intrigued me, exclaiming: "Do you want to bet on Alice De Val ?!" ... and so I contacted the black-green blonde to get to know her better. Alice De Val is a twenty-year-old university, gentilissisma, simple and reserved, who loves to play football and manages to combine her sporting activity with study, fun and her hobbies. In the calendar Graphistudio obscures the thirty-one days of July with elegance and charm. I congratulate him for the photo of the calendar, she thanks with simplicity and we pass to the interview. Read more: WE WANT TO BET on ALICE DE VAL? 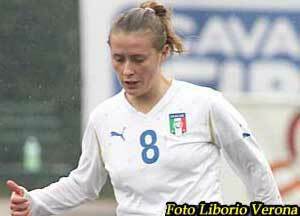 WE PRESENT A YOUNG PROMISE: GIULIA BALDINI! My attention rested on a young promise. Intrigued by his goals and the admiration of some of his opponents, I contacted, with the approval of his company, to know it better and present it to readers of our portal. Giulia Baldini it is a mine of surprises, the classic "model" girl next door. Despite his young age, he celebrates his eighteen years 22 March, has clear ideas and knows, like every woman, to organize, at best, his private and sporting life. Giulia appears to me as a polite girl, pretty, reserved, assertive, in love with football and her boyfriend, (they will celebrate eight months of engagement a day). Attends the 4 year of high school with profit and wants to become a physiotherapist, she is an animator and teaches catechism to children; He trains twice with his team and two training sessions take place with a team of males taking part in the "Promotion" championship and ... find the time to keep fit with the gym he keeps at home. It is a pleasure to listen to it, I can not resist and I ask. 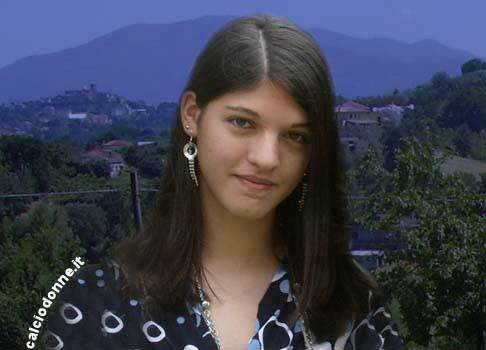 Read more: WE PRESENT A YOUNG PROMISE: GIULIA BALDINI!